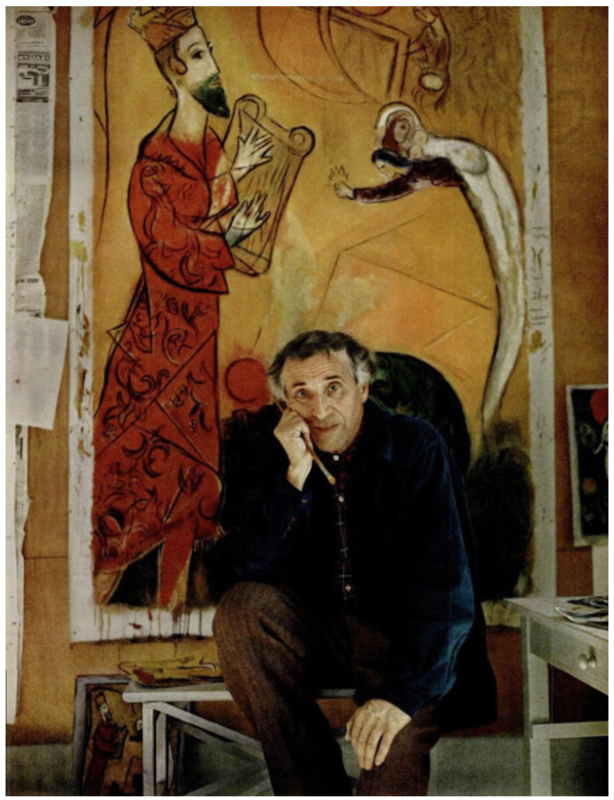 Belorussian-born French painter, printmaker and designer, Marc Chagall, poured his heart and captivation with life into his art. Based on emotional and poetic associations, the works of Chagall capture the essence of a passionate and boundless imagination. Predating Surrealism, the subjects of his pieces were among the first expressions of psychic reality in modern art. Working in a variety of media, Chagall created an immense body of work ranging from sets for plays and ballets to etchings illustrating the Bible to vibrant and stunning series of stained glass windows. With repetition of motifs and dreamlike subject matter in rich colors and in a fluent, painterly style, Chagall has been said to have reached a level of visual metaphor seldom attempted in modern art. 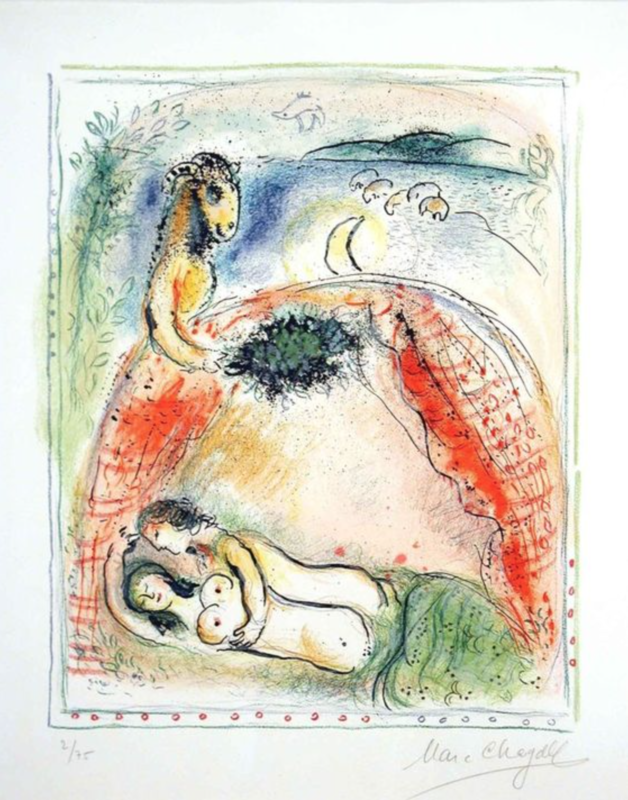 Chagall, “Land of the Gods I”, Lithograph, 25 x 20 in. 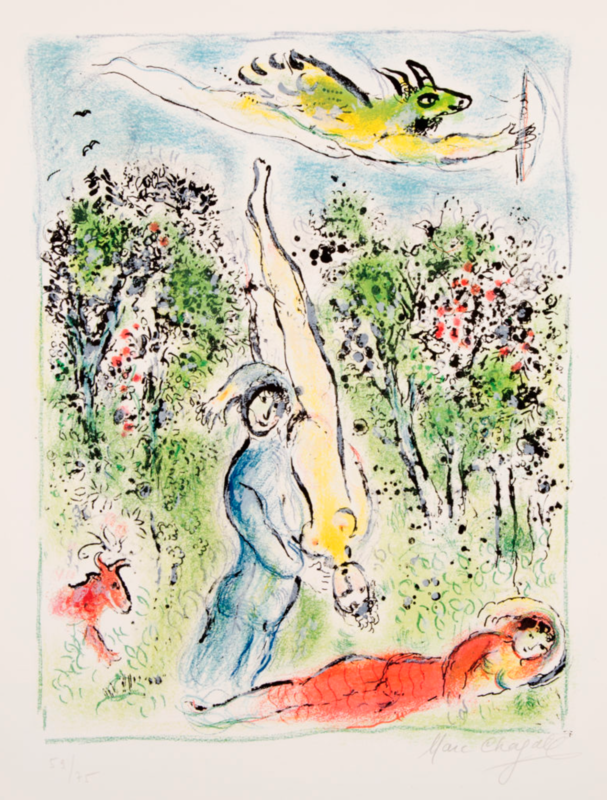 Chagall, “Land of the Gods X,” Lithograph, 25 x 20 in. 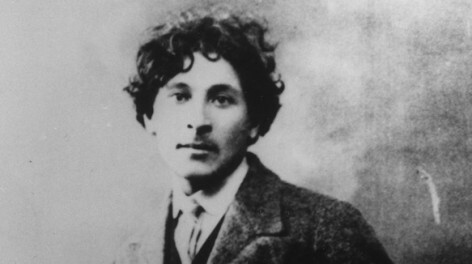 One of eight children, Chagall grew up in a small city in the western Russian Empire not far from the Polish frontier. Chagall began his studies of the arts learning the elements of drawing. At the age of 20, he moved to St. Petersburg to study for three years under stage designer Leon Bakst. After St. Petersburg, he moved to Paris, living in a ramshackle settlement of bohemian artists, many of whom were destined to become famous. Chagall was encouraged by the surrounding company and culture to rapidly develop poetic, seemingly irrational, pictorial fantasies that marked much of his earlier works. As a young artist, Chagall was already essentially the artist he would continue to be for the greater portion of his artistic career. 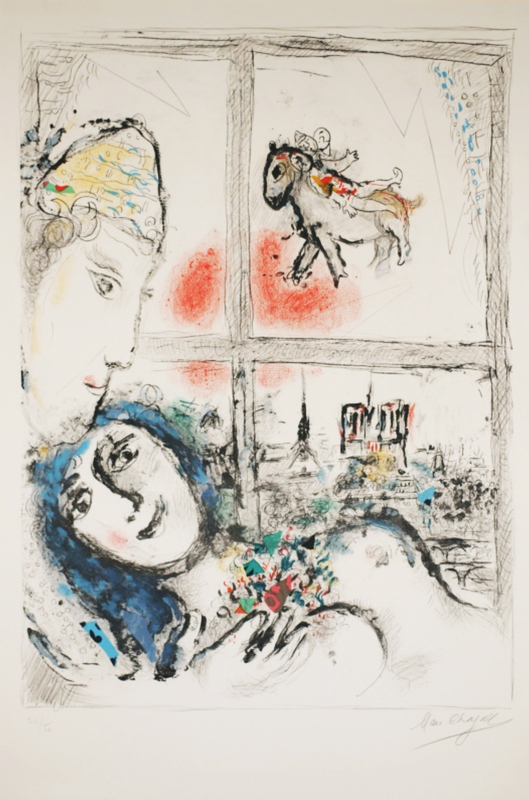 Chagall, “Paris From My Window,”Lithograph, 40 x 30 in. Chagall’s imagery is often identified by whimsical figurative elements, often upside down, distributed about his canvases in an arbitrary fashion. Memories of his childhood resurface in his paintings, along with images of Vitebsk where he grew up. After his marriage to Bella Rosenfeld, the daughter of a wealthy Vitebsk merchant, she became the subject of many of his paintings, sometimes lying on a bed of flowers, sometimes suspended mid-air with Chagall as flying lovers. 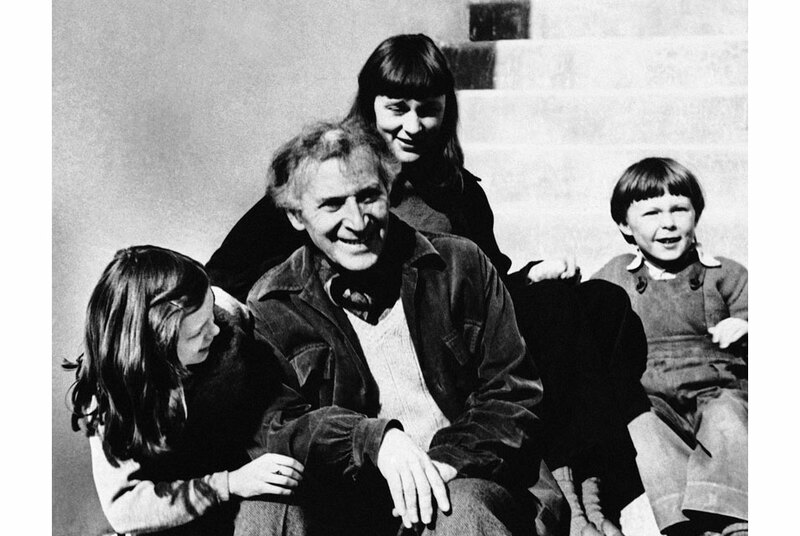 Chagall traveled extensively, working in Brittany, France, Palestine, Holland, Spain, Poland and Italy. In 1933 he exhibited a large retrospective collection of his works at the Kunsthalle in Basel, Switzerland. It was at this exhibition where his reputation as a modern master was confirmed. Chagall, “The Artist’s Wife,” Gouache on Paper, 29 x 22.25 in. 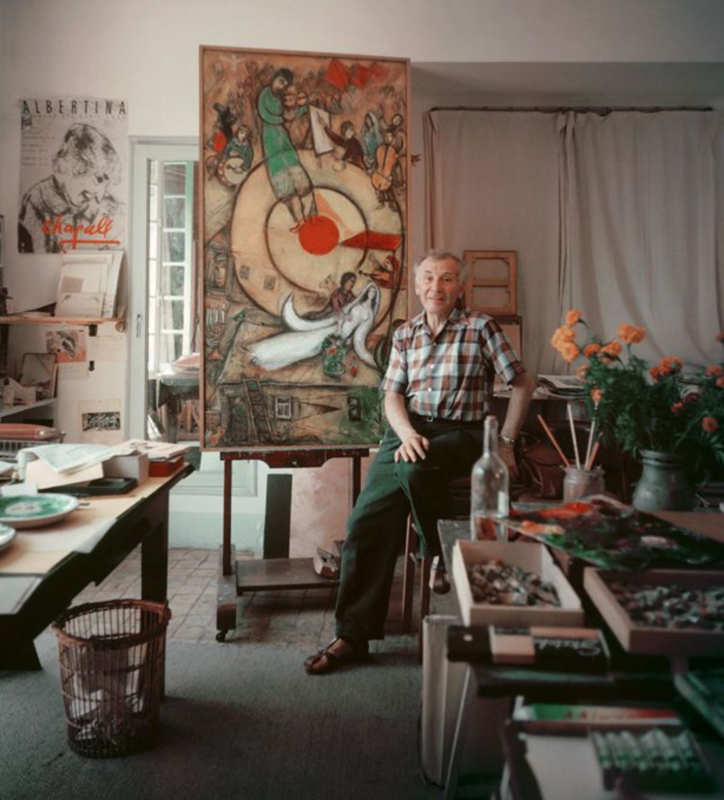 In his later years, Chagall continued to be known as a prolific artist, painting on canvas, while also completing many large public projects in other media. 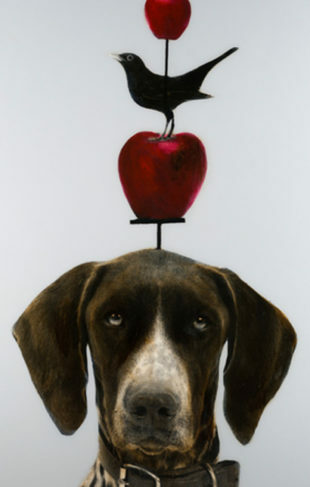 His brilliant color and magical imagery which included massive bouquets, melancholy clowns, flying lovers, fantastic animals, biblical prophets and fiddlers on roofs, helped to define him as one of the most popular major innovators of his time.